Instead of cleaning your filter yourself, you can hire the Spectrum professionals who have years of experience in all manners of equipment repairs, cleaning and installation. Whether a cartridge, diatomaceous earth, or sand filter, we've done it all and can be a great resource as we are to all our clients in the Los Angeles area. Filtration media is important as a supplement to filter grids in Diatomaceous Filters. A coating of 'earth' helps to absorb and catch small particulates of matter that otherwise would cause a cloudy appearance in the pool as well as shimmer during evening swims with the light fixture illumined. Be sure to measure properly when adding the media and create a slurry for better coating. For more that twenty-four years, the Spectrum team of service professionals are daily bringing pools back to health. The filtration of a system is critical for clean water and the elimination of dirt and debris. Diatomaceous is a common filter material and it adheres well to a filter grid assembly. It's the most popular on the market today. All brands are represented in our company and we are able to provide service and installation. Record your system models, and let us know what you have as it enables a service call to be more productive. It also allows our techs to plan ahead, and search out parts necessary in advance if needed. The wonders of Central California bring dreamy coastlines and rural inland enjoyment. But when not wandering out from home, enjoying a dip in the pool is a nice reprieve. But the water must be cleaned regularly to keep debris from getting unmanageable. We are adept at necessary repairs when a failure occurs. Interior to the filter body is a manifold that sits either on the top or the bottom, depending on the brand or model. Both designs have some benefits, but an important factor to consider is proper sizing. A Diatomite or Cartridge filter must fit the system it is serving. We take the time to analyze what your system needs are. With breezy beach air and a level of salt from the ocean, there is a corrosive effect on metals the closer to the ocean you reside. Pool filters are no exception, yet there are now excellent non-metallic materials such as fiberglass or thermoplastics used today, and they are now more popular than the old stand-bys. Sizing is important when installing a new filtration unit. That is because it must be an equal part of a balanced system that results in an inviting body of water. Most DE filters come in four optional sizes - 48 square foot, 36, 60 and 72. But the average model installed is a 48. This is because the average pool size is around 20 thousand gallons. Be sure to consider what is best for your needs. Get your new swimming pool filter installed today with a great service group who pride themselves in attention to detail from beginning to end. We start with an attentive customer care team who answer our phones and have in-feild experience as well. Trust your pool to Spectrum, as others have since 1984. The elements in every life bring balance to nature. In our backyard oasis, we are attempting the same equilibrium by attening to regular chemical testing and application in order to minimize water issues. But equal to that is a steady flow of water that is both heated when desired and filtered as needed. In nature, rivers and stream water are forced through finer stones and pebbles and sand effectively filtering out the small particles and resulting in fresh and palatable water. A man made water feature attempts to mimic nature by circulating the pool through a media that is disposable and safe. Great repairs to the Conejo Valley neighborhood community by Spectrum. Available Monday through Saturday to visit your property and solve your filtration issues. Water clarity is important and can only happen when it circulates efficiently. Tear in the filter media can result in debris returning to the pool. A simple grid replacement can help. When not riding a horse or doing chores around the garden, it may be time to check the pressure gauge and see if the filtration pressure has risen to high. Keeping dirt and debris cleaned on a periodic basis is important for helping the chlorine to do it's job. More frequent filter cleans have proven to make for better water quality. Backwash valves are employed to eject the filtration media of a diatomaceous earth vessel when time doesn't allow for a standard cleaning. Be sure to clean up the DE however, as it can make quite a mess. Now that is one great swimming pool - so we've heard it said when entering a lush backyard landscape with a sparkling body of blue water to cool off on a sweltering summer day! Be sure to have a good turn-over time for that pool. Small or large, water feature or spa, every body of water needs a process to remove fine particles. And such are the use for cartridge, sand and nylon elements to do the job! The process of clarifying water is accomplished via a system of baskets and grids. These elements work handily to ward off and eliminate all things that could prevent a beautiful sight of shimmering crystal blue that is a delight to all. Watch for turtles, lizards and other small creatures that may find their way into the skimmer basket. Usually, this first line of defense will do the job and the mitigate all such possibilities. Smaller debris will find its way however. The pique season requires utmost attention to detail when testing the water for chlorine, alkanity and pH. Be sure to also include Hardness and conditioner. A balanced pool will keep algae from growing and lessen the need to dismantle the filter. For on-site analysis of your pool equipment station with attention to whatever is malfunctioning is what Spectrum is best at. 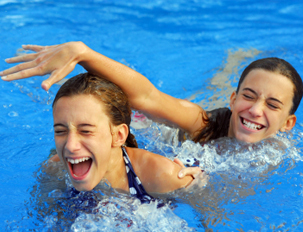 For over twenty-three years now, we have been serving our Conejo Valley clientele with all issues resulting in pristine water clarity and a healthy and fun swimming season. Enjoy your pool, leave the work to us. When the summers are hot, we who live in the Valley need a clean and sparkling pool to dive into just to cool off - not to mention the sheer joy of it. But that blue oasis requires the hard work of a filtration system that functions daily to filtrate the oils, dirt and microscopic debris from the pool. Rely on Spectrum as we deliver the best in pool care daily.